Loading: 0.4-0.6 mmol/g. ProTide™ resins contain an ideal PEG and polystyrene core leading to an optimized SPPS environment. Universal loading, hyperacid sensitive linker for access to protected or deprotected peptide acids with short (< 30 amino acids) sequences. Designed to protect C-terminal cysteine and proline from side reactions. 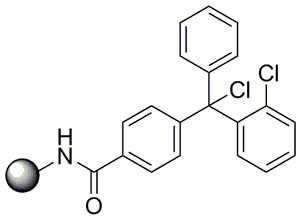 Can be used in place of trityl, 2-chlorotrityl, and HMPB resins.